John Adedayo B. Adegboyega (born 17 March 1992), known professionally as John Boyega, is an English actor known for playing Finn in the 2015 film Star Wars: The Force Awakens and its 2017 sequel Star Wars: The Last Jedi, respectively the seventh and eighth films of the Star Wars series. Boyega rose to prominence in his native United Kingdom for his role as Moses in the 2011 sci-fi comedy film Attack the Block. Boyega's other credits include historical drama film Detroit (2017), the science fiction film Pacific Rim: Uprising (2018), four episodes of the television series 24: Live Another Day and the drama Imperial Dreams (2014). Boyega received the BAFTA Rising Star Award in 2016. Boyega was born on 17 March 1992 in London, England, to British Nigerian parents, Abigail (née Aboderin), who works with the disabled, and Samson Adegboyega, a Pentecostal minister. His first role was a leopard in a play at his primary school. Boyega was a pupil at Oliver Goldsmith Primary School. While acting in a play there at the age of nine, he was noticed by Teresa Early, the artistic director of Theatre Peckham, a learning theatre for young people who live in south London. After obtaining financial assistance from a hardship fund, he joined the theatre, spending his time there outside school hours between the ages of nine and 14. Boyega's father, a preacher, had wanted Boyega to become a preacher too, but was supportive of his son's theatrical interests. In 2003, Boyega started his secondary education at Westminster City School, where he took part in various school productions. Between 2008 and 2010, he attended South Thames College at the college's Wandsworth campus to study for a National Diploma in Performing Arts. His activities at the college included playing the title role in the college's production of Othello. He enrolled at the University of Greenwich to study BA Film Studies & Media Writing, but dropped out to focus on acting. Boyega trained at the Identity School of Acting in Hackney, and appeared in Six Parties at the National Theatre and Category B at the Tricycle Theatre prior to being offered a role in the 2011 film Attack the Block. In September 2011, HBO announced that Boyega had been cast in the boxing drama pilot Da Brick, loosely based on Mike Tyson's life. Boyega was expected to play Donnie, who is released from a juvenile detention centre on his 18th birthday and begins to examine what it means to be a man. The pilot was written by John Ridley, but was not picked up by HBO. Also in 2011, he acted in the film Junkhearts in which he portrayed Jamal, a drug dealer who finds some guns and tries to sell them. 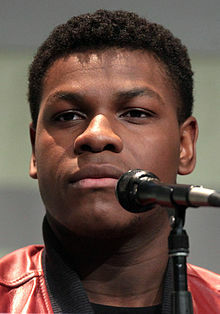 Boyega was chosen by Fionnuala Halligan of Screen International as one of the "UK Stars of Tomorrow 2011" and appeared alongside two other actors on the front cover of that magazine in its July 2011 edition. In March 2012, Boyega was cast in the film adaptation of Chimamanda Ngozi Adichie's book Half of a Yellow Sun. On 29 April 2014, it was confirmed that Boyega had been cast as a lead character in Star Wars: The Force Awakens. It was later revealed Boyega would play Finn, a stormtrooper for the First Order, who leaves the military power after witnessing their cruelty in his first combat mission before joining the fight against them. The film was released on 18 December 2015. Both the film and Boyega's performance received acclaim from both audiences and critics. In 2017, Boyega starred in Detroit, Kathryn Bigelow's film about the 1967 Detroit riots. The same year, he reprised his role as Finn in Star Wars: The Last Jedi. In January 2016, Boyega formed his own production company, Upperroom Entertainment Limited. His company co-produced Pacific Rim: Uprising (2018), the sequel to the 2013 movie Pacific Rim, alongside Legendary Entertainment. Boyega also starred in the lead role of the film, Jake Pentecost. 2011 Law & Order: UK Jamal Clarkson Episode: "Survivor's Guilt"
2015 Saturday Night Live Himself Segment: "Star Wars: The Force Awakens Screen Tests"
^ Itzkoff, Dave (22 July 2011). "John Boyega in Joe Cornish's 'Attack the Block'". The New York Times. Retrieved 8 December 2014. ^ Okoroafor, Cynthia (17 December 2015). "Star Wars opens today, and star Nigerian John Boyega is stealing the spotlight". VENTURES AFRICA. Retrieved 31 January 2016. ^ "The Attack of John Boyega". Interview. 29 July 2011. Retrieved 24 June 2012. ^ Brown, Emma (28 January 2014). "John Boyega: The Best of Next". Interview. Retrieved 12 October 2017. ^ Palmer, Jim (8 December 2015). "Everything you need to know about John Boyega – from Peckham to Wandsworth to Greenwich to Star Wars Episode VII: The Force Awakens". News Shopper. Retrieved 31 January 2016. ^ a b Turner, Camilla (24 April 2015). "Star Wars: John Boyega, the boy from Peckham who stormed Hollywood". The Daily Telegraph. Retrieved 22 October 2015. ^ Turner, Camilla (25 April 2015). "Star Wars: Five things you didn't know about John Boyega". The Daily Telegraph. Retrieved 22 October 2015. ^ "Theatre Peckham". Theatre Peckham. Retrieved 31 January 2016. ^ "Memorable OWCs". Old Westminster Citizens' Association. Retrieved 31 January 2016. ^ "From South Thames to Star Wars: college star lands role in a Galaxy Far Far Away". South Thames College. 2 May 2014. Retrieved 31 January 2016. ^ "Back to college for Star Wars actor". South Thames College. 16 November 2015. Retrieved 31 January 2016. ^ "The Force is strong with Greenwich". University of Greenwich. 17 December 2015. Retrieved 31 January 2016. ^ "Hall of Fame". identitydramaschool.com. 2012. Archived from the original on 13 July 2011. Retrieved 25 June 2012. ^ "Attack the Block feature item". dvd365.net. 2012. Retrieved 25 June 2012. ^ Yamato, Jen (1 August 2011). "Attack the Block's John Boyega on Going 'From Hoodie to Hero,' and Taking Hollywood by Storm". Movieline. Retrieved 24 June 2012. ^ Wightman, Catriona (1 September 2011). "John Boyega to star in Mike Tyson, Spike Lee HBO pilot 'Da Brick' – US TV News". Digital Spy. Retrieved 24 June 2012. ^ Jeffery, Morgan (14 March 2012). "'Da Brick': HBO passes on Mike Tyson boxing drama – US TV News". Digital Spy. Retrieved 24 June 2012. ^ "Stars of Tomorrow 2011". Screen Daily. 30 June 2011. Retrieved 8 December 2014. ^ Pearson, Ben (29 March 2012). "Attack the Block star John Boyega joins Half of a Yellow Sun". Filmonic. Retrieved 24 June 2012. ^ "Star Wars: Episode VII Cast Announced". StarWars.com. 29 April 2014. Retrieved 29 April 2014. ^ Bradshaw, Peter. "Star Wars: The Force Awakens review – 'a spectacular homecoming'". The Guardian. Guardian News & Media Limited. Retrieved 18 January 2016. ^ McWeeny, Drew (16 December 2015). "Review: JJ Abrams breathes new life into 'Star Wars' with 'The Force Awakens'". HitFix. Retrieved 19 December 2015. ^ Cohen, Sandy (15 December 2017). "John Boyega talks 'Last Jedi,' personal parallels". The Advocate. Associated Press. ^ @JohnBoyega (6 June 2016). "So happy! My company UpperRoom Productions founded by myself & @MrFemiOguns, will co-produce #PacificRim2 alongside @Legendary" (Tweet) – via Twitter. ^ Fleming, Mike (6 June 2016). "'Star Wars' Star John Boyega Takes Lead In 'Pacific Rim' Sequel". Deadline. Retrieved 21 December 2016. ^ John Nugent (11 March 2016). "Jameson Empire Awards 2016: Star Wars and Mad Max lead the nominations". Empire Awards. Retrieved 18 February 2016. ^ Berge Garabedian (8 January 2016). "Golden Schmoes 2015 Awards". Golden Schmoes. Retrieved 11 March 2016. ^ Lovett, Jamie (18 February 2016). "Kids' Choice Awards: Adele, Justin Bieber, 'Star Wars' Among Nominees". The Hollywood Reporter. Retrieved 11 March 2016. ^ "Saturn Award nominations". Saturn Awards. 24 February 2016. ^ Hall, Jacob (15 February 2019). "'Star Wars: Episode 9' Has Wrapped Filming – See a New Image From the Set". /Film. Retrieved 15 February 2019. ^ Sarah Deen (5 January 2016). "John Boyega joins Nickelodeon's Tinkershrimp & Dutch". Metro.co.uk. ^ Errico, Marcus (3 July 2017). "New Star Wars Cartoon Shorts Debut Online, Bringing Female Heroes in Full Force". Yahoo!. Retrieved 5 July 2017. ^ "John Boyega to star in Woyzeck at the Old Vic Theatre". Tuppence Magazine. 18 March 2017. Retrieved 18 March 2017. Wikimedia Commons has media related to John Boyega. This page was last edited on 13 April 2019, at 07:48 (UTC).